April 16, 2008 By Denny Hansen & filed under All Articles, Handguns, Weapons. 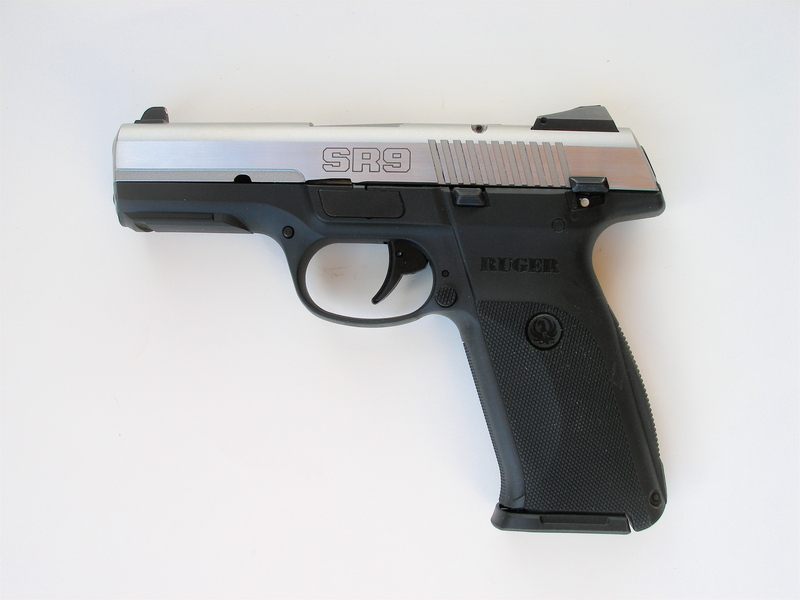 Left side view of Ruger’s SR9. 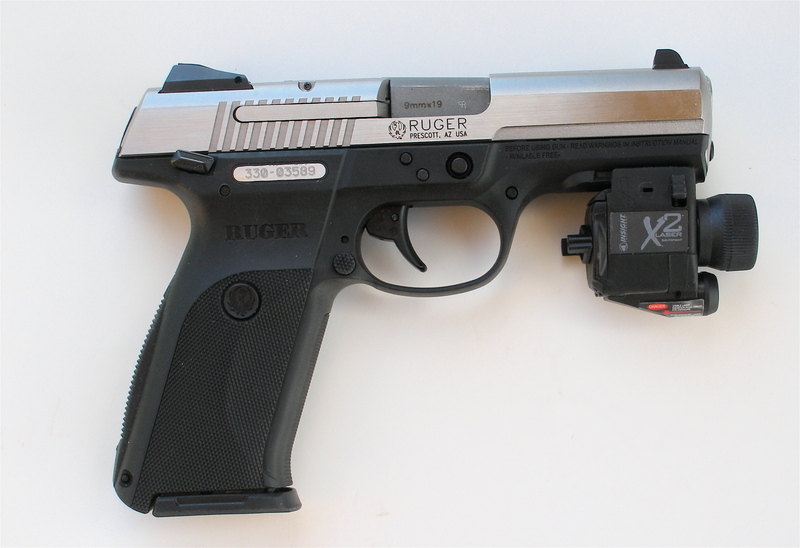 One of the newest offerings from Ruger is the SR9 9mm semiautomatic pistol. 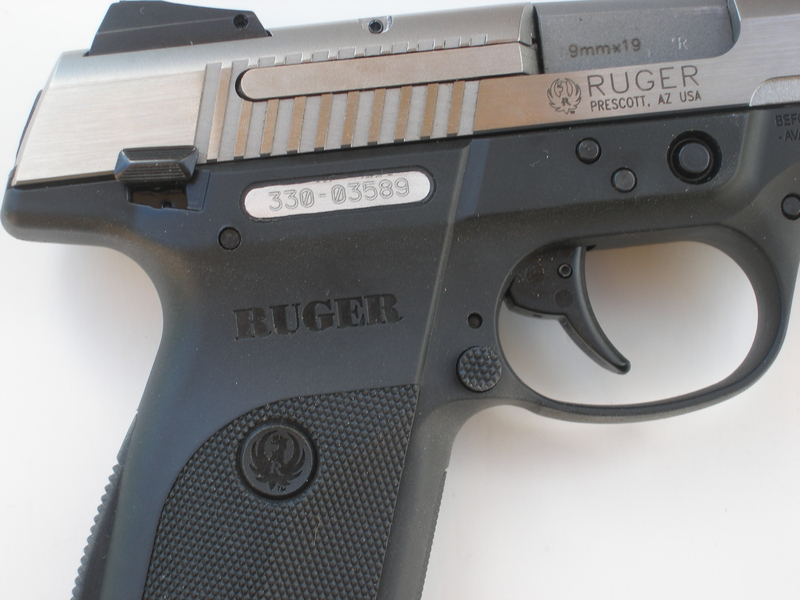 It is the first striker-fired design to be made by Ruger. I recently received one for test and evaluation. The SR9 comes shipped in a molded hard case and includes the pistol, a gunlock, two 17-round magazines, a magazine loader and a manual. The frame on the SR9 is manufactured from glass-filled nylon. 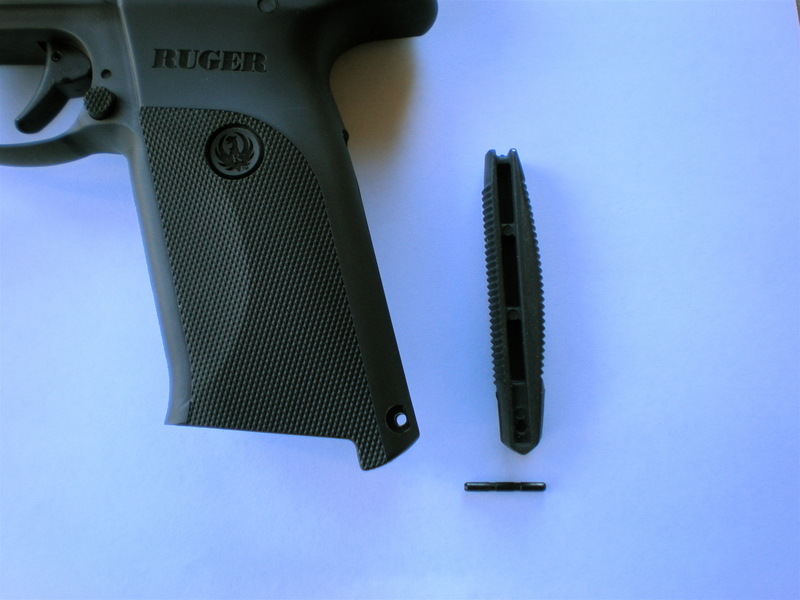 Structurally rigid, Ruger also claims that glass-filled nylon reduces felt recoil. The backstrap of the frame is reversible from arched to flat. This is easily accomplished by pushing out the retaining pin located at the bottom rear of the frame, removing the backstrap and reversing it. No special tool is required to perform this operation. Manual safety and magazine release are fully ambidextrous. One of the first things I noticed upon examining the SR9 is that it has a short reach from the backstrap to the trigger (approximately 2 ½ inches), which allows shooters with even small hands to get a natural grasp on the pistol without “monkey gripping” it. Although the SR9 has a high-capacity magazine (17 rounds), the grip is no thicker than one of my 1911 pistols with slim-line grips. The 17-degree grip angle is also very close to the 18-degree grip angle of the 1911, making it point very naturally. The frontstrap and grip panels feature 22 lines-per-inch checkering, but are not at all abrasive. Appealing to left-handed shooters, both the magazine release button and the safety are fully ambidextrous. The SR9 has a molded-in rail on the frame that will accept lights or lasers. Manual safety lever is small, but functional. The top of the SR9’s stainless steel slide has a brushed finish, which should help reduce glare, while the sides are polished. 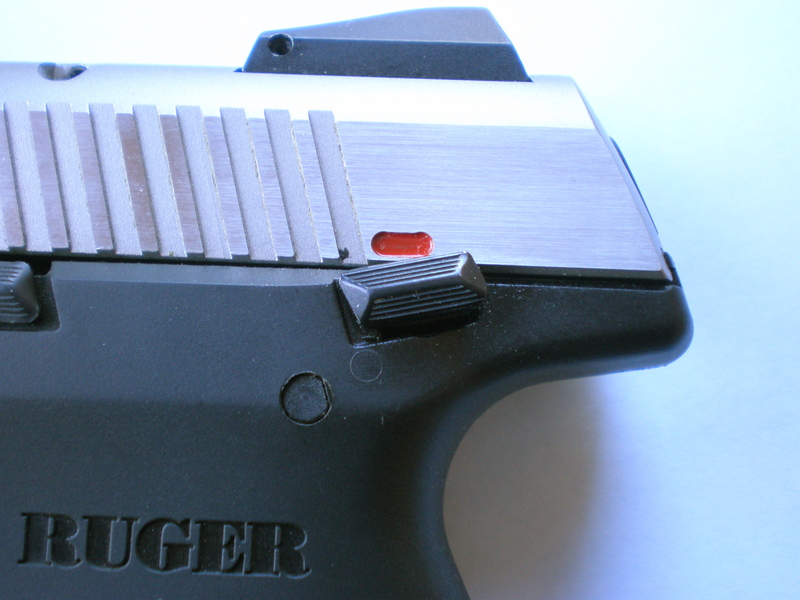 There are generous cocking serrations, which take up 1¾ inches, at the rear of the slide. Sights are of the three-dot type. 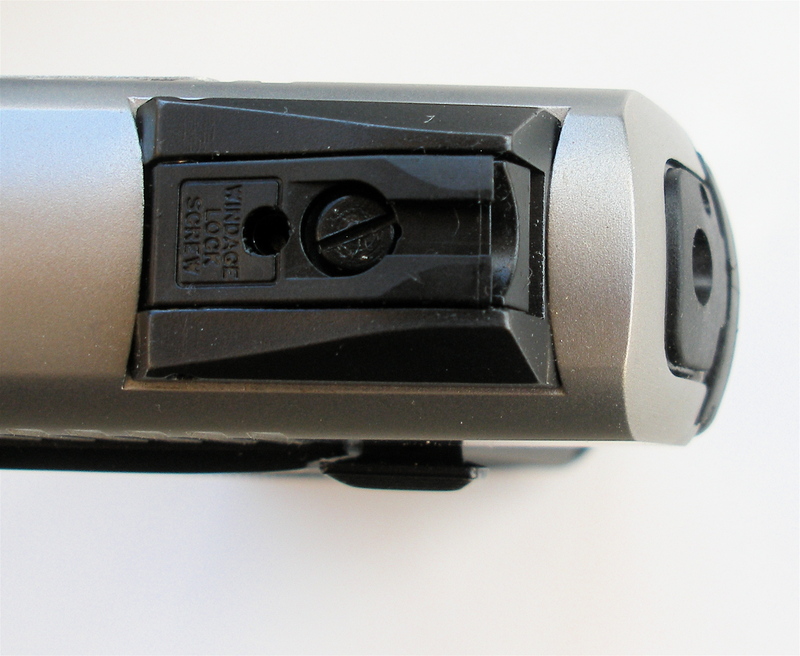 The low-profile rear sight is click adjustable for elevation. Both front and rear sights are drift adjustable for windage. Close-up of loaded chamber indicator. As noted earlier, magazines for the SR9 have a 17-round capacity (ten-round magazines are supplied in non-free states). The magazines have a removable baseplate, making maintenance easy. 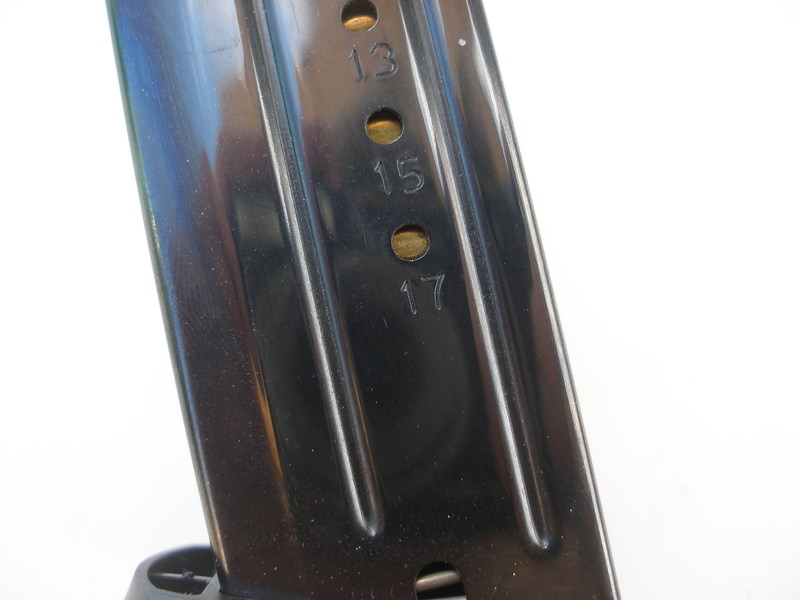 Witness holes to see how much ammunition is left in the magazine, starting at four rounds and going all the way to 17, are on each side of the magazine—even numbers on the right side, odd numbers on the left. 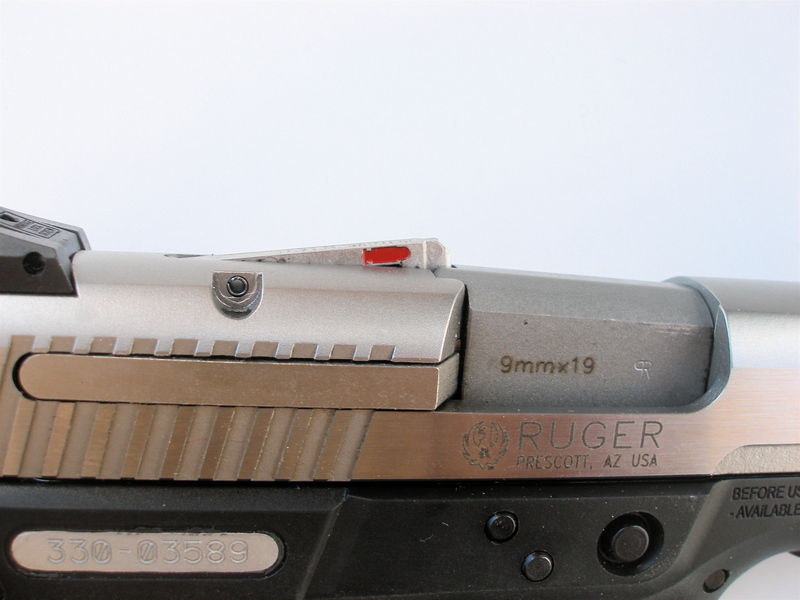 The front of the magazine is marked SR9, 9x19mm and has Ruger’s logo. Between the glass-filled nylon frame and the stainless steel slide the SR9 should be, within reason, fairly maintenance free. Witness holes on magazine show how much ammunition is on tap. I took the SR9 to the range with factory ammunition from Black Hills, CorBon, Hornady and Triton, as well as a quantity of hard-cast lead reloads. Bullet weights varied from 90- to 147-grain subsonic loads and included both full metal jacket and hollowpoint bullet types. The manual safety operates like a 1911 pistol—up is “safe” and down is “fire.” The safety is smaller, much smaller, than I’m accustomed to, protruding out from the frame only 1/8-inch (measurement is approximate). Although I had no problem operating it with bare hands, I was concerned that it might be too small to operate with gloves on. I was able to manipulate the safety reliably while wearing lightweight tactical gloves from Southwest Motorsports and Nomex flyers gloves. I was not able to operate the safety consistently with Wells Lamont heavy leather gloves. Back strap is reversible for either flat or arched profile. I also experienced some apprehension early on in the evaluation in regard to the trigger pull weight, magazine release and the slide not locking back when the last round in a magazine was fired. 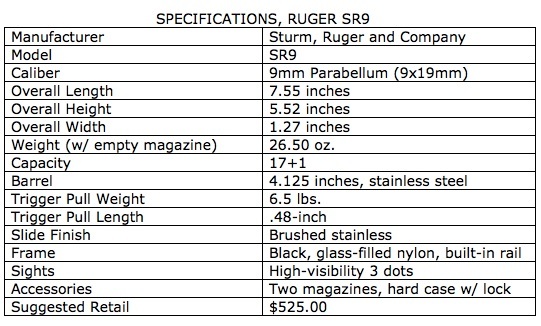 Ruger’s specifications for the SR9 state that the trigger pull weight is 6.5 pounds. Initially the trigger pull on the test SR9 felt much heavier. The scale on my RCBS Trigger Pull Scale only goes to eight, and it would go off the scale before the striker fell. At the end of the evaluation, it seemed lighter and had smoothed out. Using the scale again, it revealed that the trigger had become somewhat lighter, breaking slightly over specifications between 6.5 and 7 pounds. Likewise, the ambidextrous magazine release was quite stiff initially, especially when operated left-handed, taking more force than should be necessary to release the magazine. By the end of the evaluation, magazines ejected and fell free with what I consider to be almost the perfect amount of force—enough to make it a conscious act, but not so light that the magazine release button could be accidentally depressed while holstered. Integral rail on frame will accept tactical lights/lasers. For the first three magazines fired through the pistol, the slide would not lock back after the last round was fired. This problem also solved itself during the evaluation, as the slide locked back after the fourth magazine was emptied. This malfunction did not reoccur throughout the rest of the evaluation. The above is not a condemnation of the new SR9. Rather, it is an affirmation that some firearms need a short “break-in” period to perform their best. The majority of the shooting was performed standing, off-hand at 25 yards. Point of impact was about five inches high at this distance, but after making a slight adjustment to the rear sight, accuracy was deemed adequate, as all rounds fired stayed within an eight-inch circle on a standard IPSC-type target. There were no failures to feed or eject throughout the 500-round evaluation—the SR9 gobbled up everything it was fed regardless of bullet shape or type. Ejection was positive, with spent casings thrown approximately 12 feet to the four o’clock position from the shooter. Rear sight is click adjustable for elevation and drift adjustable for windage. My impression over the course of the evaluation was that, for a pistol that has a total capacity of 18 rounds, the SR9 is surprisingly slim. There are no sharp edges on the pistol to abrade skin, clothing or a holster, with every part nicely blended into the next. These features make it ideal for concealed carry. And, while the 9mm Parabellum cartridge is not my first choice in a defensive handgun, I would not feel unarmed with the SR9—not at all! With new additions to the line like the SR9—freedom-hating politicians notwithstanding—Sturm, Ruger & Company will be around for another 59 years.